Unusually, I did not review the 2017 Turner prize exhibition when it opened in Hull. It coincided with other important openings, and I thought it made sense to wait until the prize was about to be awarded before rating the runners and riders. Other reviewers have, therefore, had their say already on the event, and — with rare positivity — branded it a success. “The most serious, accessible Turner exhibition this century,” whooped the Financial Times. “Bang a drum for the Turner’s coming of age,” percussed The Observer. Primed by this enthusiasm, I was expecting the 2017 show at the Ferens Art Gallery to be a humdinger. But it isn’t. It doesn’t hum. It doesn’t ding. It sighs, it groans, it preaches. 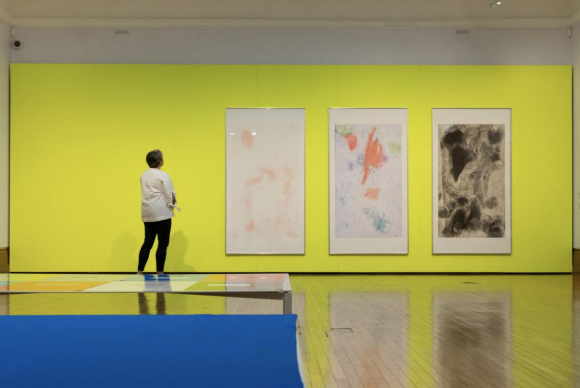 As has become the norm with Turner shortlists, the chosen artists have been selected chiefly for displays of their work that few of us can have seen. 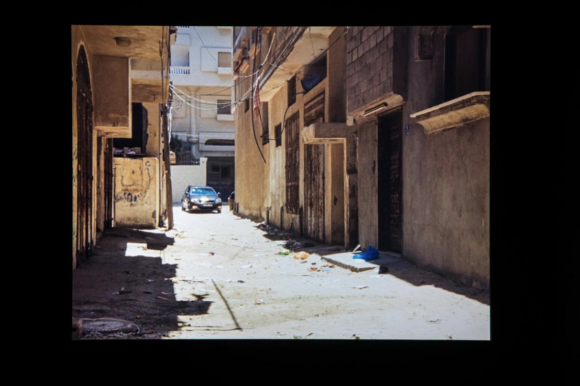 Andrea Büttner has been singled out for shows in Switzerland and LA; Rosalind Nashashibi for an exhibition in California and for her contribution to Documenta 14 in Kassel, Germany. 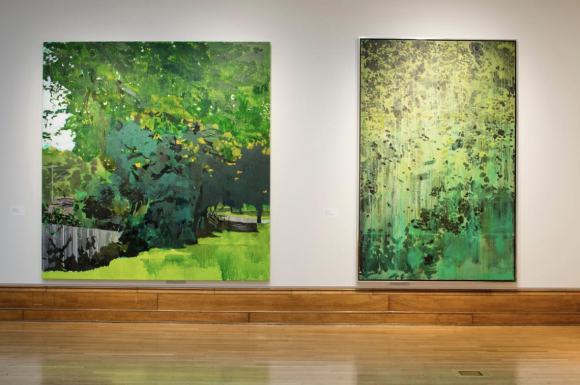 Hurvin Anderson has shown his work in Canada as well as Nottingham. Only Lubaina Himid can be said to have had a tangible impact on British art this year, with exhibitions in Oxford, Bristol and Nottingham. Thus the Turner has become an air-miles event, catering for the tastes of air-miles curators. And you could not ask for clearer examples of its instinctive lack of interest in British issues than the cinematic ramblings of Nashashibi, who is showing two films, one about Guatemala and the other about the Gaza Strip. The Guatemala film, funded by Documenta 14, sees her snooping around a bungalow in Panajachel in which two Austrian/Swiss artists, mother and daughter, are tending an overgrown tropical garden hidden behind an encircling wall. Vivian’s Garden is a loose mix of snippets of speech from the two women, close-ups of their possessions, with recurrent cuts to the outdoors, where the encroaching vegetation becomes increasingly dampening and morbid. I suppose it’s a rumination upon the relationship between the invasive and the endemic, a rebuttal of the tropical myth, but it takes so long to deliver that it soon prompts a Guatemalan torpor. The painter Hurvin Anderson, born in Birmingham of Caribbean parents, is another recorder of tropical paradises, although his feel more cheerful. A suite of recent landscapes confronts us with beautiful bouquets of trees, leaves, branches, flowers, characterised by a wildness you don’t find in English gardens. These bright calypso moods are contrasted deliberately with a selection of earlier paintings, from 2008, featuring the blank interior of a barber shop. Sitting in a barber’s chair, a slumped figure has had all his hair shorn off, and the cutting — as with Samson — seems to have sapped his strength and propelled him into a state of Nashashibian torpor. The exuberance of the vegetation has given way to the strictness of the great British haircut. Anderson sports impressive dreadlocks, so it is clear which side he is on in the battle of the cultural haircuts. To accommodate the show, the Ferens has shifted out its Old Masters and created makeshift display areas in which everything seems to clash with the floorboards. There’s an air of a visiting trade fair about it. It weakens the impact of Anderson’s paintings and kills the work of Andrea Büttner. Büttner, from Stuttgart, gives us a dreary display of political minimalism in which colour-coded rectangles and flimsily drawn snippets of imagery are supposed to combine into a critique of the modern world and its mores. Like many German artists, her aesthetics feel as if they were designed on a clipboard. Nothing she shows us sits happily on the battered brown floorboards of the Ferens, especially not the minimalist coffee tables on which she has mounted a diagrammatic examination of the depiction of beggars in Old Master art. If you want beggars, Andrea, exit the Ferens and walk down the high street to the station. You’ll find scores of them, hugging the doorways, sheltering under the “Welcome to Hull” signs and refusing to form neat minimalist rectangles. Damn these Yorkshire beggars. They’re as untamable as Hurvin Anderson’s hair. In her second room, Büttner presents a travelling display about the French philosopher Simone Weil, created by the Peace Library in Berlin and borrowed in its entirety for this show. Yawn. It consists of paragraphs of Weil’s mystic babblings, illustrated with apposite photographs by Ansel Adams, André Kertesz and others. The photos are marvellous — the best art in Büttner’s display — while the emphasis on rootedness in Weil’s appended texts gave me an idea. Why not invite the unfortunates in the high street to camp out in Büttner’s display? They’d be warm, they’d be pertinent, they’d be rooted. The Turner has had a change in the rules this year: the age limit of 50 has been scrapped. When the award started, it didn’t have an age limit either, and fast became a distinguished-service medal for those who had been around long enough. Only when the age limit was imposed did it spring into life as a transformative award that could change an artist’s career. The scrapping of the age limit is, therefore, a regressive step. 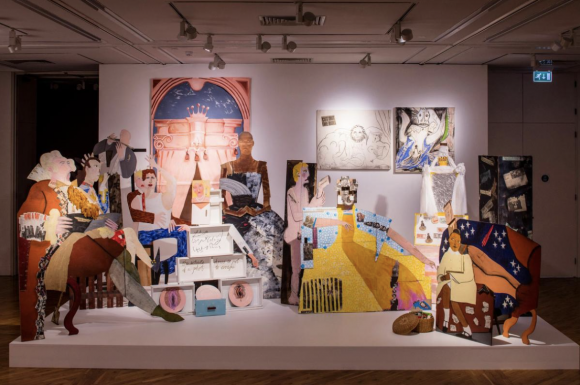 But as this is the first Turner under the new rules, it is not yet a problem, and the inclusion of Lubaina Himid, 63, is something to welcome. 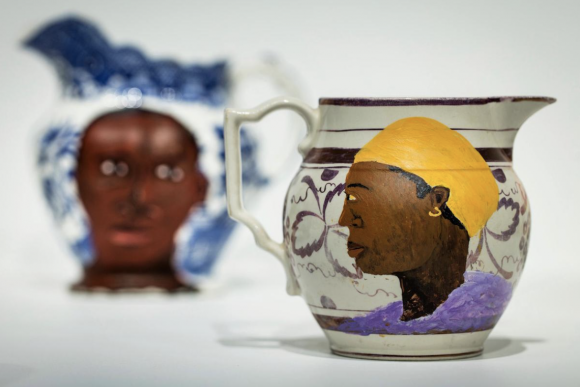 Throughout her feisty career, Himid has drawn attention to the neglect of black history in British art. 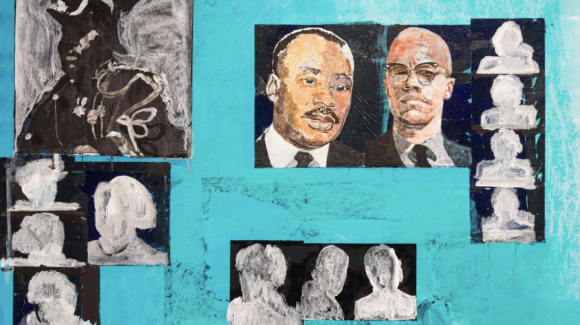 She has done it in various ways — with paintings, collages, sculptures — and her contribution is a précis of these approaches, the earliest examples dating from 1986 and the latest from 2016. So it’s a one-room retrospective, a cultural MBE, rather than a reflection of “outstanding exhibitions and projects presented over the past year”, as stated in the Turner rules. But I forgive it all that because it is so good. The 1986 work, a full-size stage set inspired by Hogarth’s Marriage A-la-mode and starring Margaret Thatcher and Ronald Reagan as the corrupted lovers, is a Gillray cartoon in 3D, knocked together out of bits of two by four. Eighteenth-century Britain, with its beautifully attired black slaves and its corpulent horse-riding gentry, is the inspiration also for a wicked dinner service, hand-painted by Himid, in which various bits of fashionable Enlightenment crockery are haunted by the unenlightened story of slavery. On one side of the tureen is a pretty willow pattern, with rivers and trees; on the other, the staring face of a black slave. Beautifully displayed, for once, it’s the exhibition highlight. With her winning combination of power and cheek, Himid should win easily.